Every blue moon, we spy a baseball card that has a baseball card on it. In my experience, it has always been some type of photo trickery of a player holding a card of themselves that is the actual card and going on for infinity. It's kind of a mind bender, but trickery none the less. Dan from "The Other World" sent me a stack of Tony Gwynn's completing our Phillies and Stickers trade. This was an amazing package. When I opened it and saw the 50 count case, I said to myself that it couldn't all contain Tony Gwynns. I was wrong. Besides a few Topps dupes, it was mostly gold that I had never seen before. I guess it does pay to not collect anything but Topps and then start seeing all that Fleer, Donruss, Leaf and UD had to offer. Speaking of Upper Deck, I noticed something rather peculiar on the 1992 UD Gwynn card. Let's dole this out bit by bit. 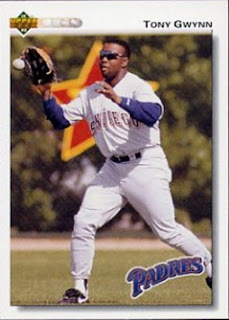 First, is the 1991 UD Gwynn All Star Game Card. It's a rather bland card of Gwynn signing autos at the Toronto All Star Game. He looks less than thrilled. I wonder why? Now lets move on to the card at hand. Nothing special here, but let's look at the obverse. 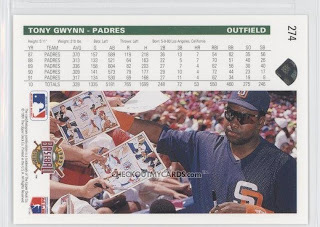 Gwynn is still signing autos, but wait! He's still unenthusiastic, and if you look at the programs he's signing, they are from the 1991 Toronto All Star Game. So, same photo shoot as the 1991 UD AS Game card, but from a different angle. And here is where it get's interesting. Let's zoom in on the lower left hand corner. Why, that's a baseball card! Coming from San Diego, I know that baseball card like the back of my hand. Time to flip and zoom a little more. Hmmm. Blue checkerboard borders. Red name box. Blank stare from a should of been first time HOFer. Why, that's Roberto Alomar! 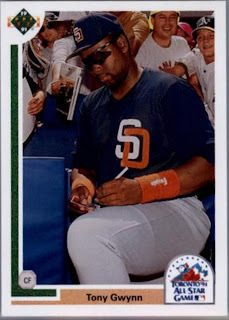 No wonder TG was not so thrilled having to sign an Alomar card! Way to go Upper Deck. 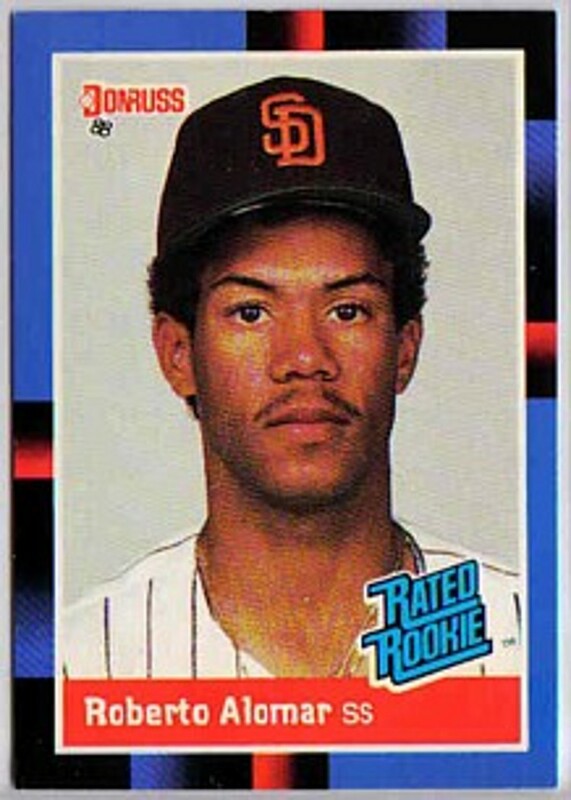 You successfully incorporated a 1988 Donruss card into your 1992 set. Now that is some awesome QA/QC. Wow!! Great catch there, Doc. I don't think I have the patience to find that kind of stuff. I've got an Upper Deck card where a player is signing a Score card. And I believe one of the blogs showed a UD card in which someone was signing a Topps card. Good job on figuring out the player.